With many years’ experience in the manufacture of dental veneers, we can help you achieve the first-class restoration of your patients’ smiles. We do strongly recommend e.max ceramic veneers which can either be pressed in the pressing-furnace or milled. The lithium disilicate glass ceramic of an e.max veneer, combines excellent durability with superb aesthetics. The translucency of e.max veneers generally gives a more natural finish and a better match with the patient’s natural teeth. 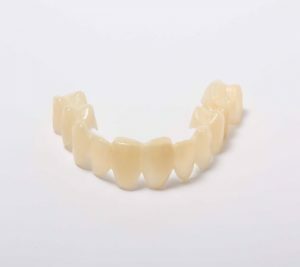 Compared to other porcelain veneers, e.max veneers are highly resistant to chips and scratches and they have the advantage over Zirconia veneers, that they can be bonded rather than cemented to the tooth. They have a stained and glazed finish. 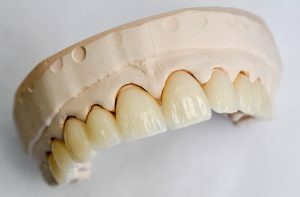 We have two versions of the e.max veneers, the first is full contour e.max (the whole veneer is made from e.max lithium disilicate) and the second is our core e.max– the later product involves pressing a thin layer of porcelain on top of the core e.max, allowing greater refinement of the finished appearance. Core e.max combines the strength of e.max with the superior surface detailing of a traditional feldspathic porcelain veneer and it has thus become a firm favourite for many of our cosmetic dentists. In short, e.max has been used in the dental surgery for well over 10 years and it is by far the most popular choice of material amongst our dentist for private restoration work. We also supply milled zirconia oxide veneers. Tetragonal zirconia veneers are even stronger than those made from e.max and they are available in a range of shades. We can now also offer a very popular zirconia layered shading effect, which gives a more natural appearance than traditional zirconia veneers. Dentists generally consider zirconia veneers are better suited to restorations where the underlying tooth has a dark colour. However patients may wish to note that the appearance of the stain used to give zirconia veneers their shade, may subtly change over time. Another option for private work is feldspathic porcelain – due the time consuming and demanding nature of this traditional method of manufacture, it is now rarely used; however for dentists willing to commit to the required artistry and bite control, hand-made feldspathic porcelain veneers, painstakingly produced by our master ceramist using platinum foil separators in the furnace, do provide the ultimate aesthetic result, virtually indistinguishable from natural teeth but obviously with less strength than more modern alternatives. Finally there is a new kid on the block Shofu HC. This is a millable block of porcelin designed to combine the strength of a full contour product with the aesthetic appeal of a cermaic veneer. Its also available in a bilayer finish for enhanced visual effect. 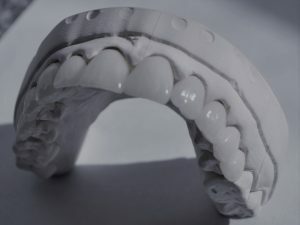 Moving down the price scale, we can also supply light-cured veneers which can be adjusted in the dentist’s chair (for temporary use) and we also have a range of economy pressed porcelain veneers suitable for NHS and cost-conscious patients. Obviously, these options don’t match strength of e.max or zirconia veneers. Phone or email us today to discuss your requirements. 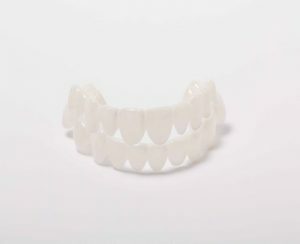 For patients who either have a limited budget or are treatment averse, clip-on veneers (sometimes called a ‘Snap-on Smile’) are proving an increasingly popular choice for effective smile enhancement. Furthermore, some patients like the idea that clip-on veneers do not involve having to remove surface enamel. Historically, and for understandable reasons, many dentists have had a poor opinion about such products. Most clip-on veneers are supplied through Direct-to-the-Public websites; the market leaders are Instasmile and Brighter Image Lab. However, despite the mixed reputation this type of product has acquired, we are now seeing a small but nevertheless increasing number of dentists offering their patients clip-on veneers. Clip-on veneers might also be considered for short-term restoration eg to give patients “an idea” of what their teeth might look like if they choose to have permanent veneers or teeth-whitening or as a temporary measure until the patient is ready to proceed with or finish permanent treatment. It must not be forgotten that Dentists have some very real advantages competing against snap-on-smile internet companies, including of course being able to take a really accurate impression as well as giving trusted face-to-face advice. We can supply superior hand-finished, glazed, milled clip-on veneers manufactured from the dental grade acetyl resin. Acetyl has a number of advantages compared to cheaper thermoplastic materials used by most internet-based suppliers of clip-on veneers, including that it is more hard-wearing, can be offered in a wider range of shades, and can be manufactured to a much thinner and more precise specification. If you are interested in offering clip-on-veneers to your patients, please do contact us.